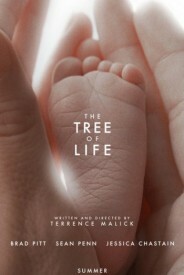 It will take some time before I can say anything very intelligible about Terrence Malick’s The Tree of Life. But here are some initial thoughts, for what they’re worth. (2) There ought to be more films like this, so that we’d have something to compare it to and evaluate it against. To be sure, there are a lot of movies that come to mind while watching, but they range across the whole spectrum of cinema — from Tarkovky’s Mirror to Kubrick’s 2001 to Fellini’s 8-1/2 to Bresson and late Godard and Brakhage and Welles and the Ansel Adams moments of Planet Earth and Baraka (redeemed here by immersion in well-crafted cinematic narrative) through to numerous coming-of-age stories and 1950s suburban melodramas — and none of them quite covers the places this film goes. The question of whether and how it holds together is the one to think about; or maybe the one to completely forget about until some time has passed. (3) That a film should be so upfront in its (ambiguous but pervasive) spirituality and the critics not all gag out loud — only some of them have, and not even close to a majority — is an interesting sign of the times. Maybe even indicative of a paradigm shift. Just a little kick in the head for those dinosaurs and the beach coda? Alright, let me try for something a little more substantive. It’s about the flow of images, fragments, glimpses, memories, dreams, feelings, the flow of emotionality in its thickness and its tensility; the flow of internal voices and questions that punctuate the quest (Jack O’Brien’s/Sean Penn’s) for sense; the flow of connections, felt, probed but never rendered exact, between past and present, cause and complex effect, moments of loss and the haunting abysses they leave behind; the flow of light and sound, of music (several requiems among them), and of the camera-eye — under Emannuel Lubezki’s brilliant direction — almost ceaseless in its elliptical motion in and around and toward and away from the people and things that populate this unsettled world. 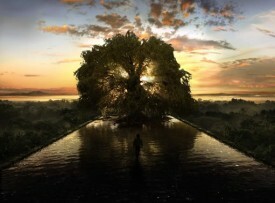 By contrast, in its mimicry of life and nature, Tree of Life dissolves narrative — at least linguistic narrative — to its most visually fluid state, allowing iconography to flow into swirling eddies of pictorial flux, not merely convergences of information, but projections of life that despite their conceptual and simulated forms seem perfectly in keeping with our experience. Tree of Life is less a narration than it is a pictorial genesis, evolution, and lineage of timeless primordiality to the present-day personal. We witness a succession of conceptual streams of thought flow through one another on a variety of physical levels, see theoretical manifolds converging, all as if before the formation of language. It’s Tree of Life‘s perpetual flux and tensions, even more than the relentless beauty of the montage and action, that keep Tree of Life vibrant and provocative. In fact the beauty of the film is too constant, to the point that its run-on picturesqueness at times becomes tedious, even exhausting. (5) Related to that, one of the film’s first lines is the mother’s about there being two ways in life, “the way of nature and the way of grace,” with her modeling the latter and her husband the former. But then the entire film goes on to show how the two are really one: torn, divided among themselves, but unmistakeably one. The synthesis occurs through the struggle for meaning. This is the film’s spirituality. For all of its Book-of-Job biblicality, and Malick’s own Heideggerian pedigree, it really feels like a Peircian-Whiteheadian process-relational faith: faith in evolution through the struggle for meaning amidst the openings afforded by every dissonant, but grace-accessible, moment. The struggle of Secondness toward ultimate/impending Thirdness (with Freud and Job thrown in). Things arise, of their own accord, in the ceaseless production of novelty (firstness). In actualizing they come into discord, conflict, tornness (secondness), from which we, individually and collectively, wrest meaning (thirdness). The result looks something like this (the film). Whatever we end up thinking about the film, that trajectory going from the Lumières to The Tree of Life — as one point shooting out from the center of the branching tree, the tangled bank, of cinema — is more than just “interesting” to contemplate (as Darwin called that other evolutionary tree). It’s pretty stunning to contemplate. Maybe the best advice is this: Think of the film as a celebration of the power of the moving image, the image that moves us with the movement of the living feeling that pulsates in all things. Some of its movements may be clunky, some may grate, but let it keep flowing and see where it takes you. (i) One of the best reviews of the film I’ve read is a dialogue about it between Jack Bellamy (a longtime Malick fan) and Ed Howard (a relative Malick newbie) at The House Next Door. Thanks for sharing valuable and very informative post. This will really catch the attention of the viewer. Everything that tackles about life is quite interesting for me. Somehow you can get ideas that will help improve you as an individual. Whatever ups and downs still life must go on. Hi Adrian, hope you and your triad are well. Just saw Terrence Malick’s THE TREE OF LIFE, which seems very religious, especially Catholic, mucho masculine, with femininity embodied solely in the mysterious Mother, drifting diaphanously toward the distant light, where Dad can be derisively dismissed. Your post poses the film in relation to philosophy as follows: “it really feels like a Peircian-Whiteheadian process-relational faith: faith in evolution through the struggle for meaning amidst the openings afforded by every dissonant, but grace-accessible, moment. The struggle of Secondness toward ultimate/impending Thirdness (with Freud and Job thrown in). Things arise, of their own accord, in the ceaseless production of novelty (firstness). In actualizing they come into discord, conflict, tornness (secondness), from which we, individually and collectively, wrest meaning (thirdness)”. Most critics agree that the dinosaurs and cosmic nebulae were distractions, while the childhood reconstruction was fabulous, and the sappy final scenes of blissful souls floating about the beach was a “heavy-handed symbolist … letdown” (Ed Howard at slantmagazine on Jun22). Malick’s story lagged that of my own life by about 10 years, but with a few significant differences. I was also the oldest son, and my Father was very much like Brad Pitt in the film, but I had an older sister, who died tragically before I was born (in the 1953 hurricane that hit Cape Cod). 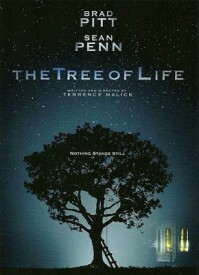 This loss mellowed my Father such that he was never as obsessed as the Father in TREE OF LIFE. While our dinner-time discussions were pretty painful for me, I had a younger sister sitting next to him, who took the brunt of his heat with a playful hot coffee spoon to her cheek. Another quick comment to endorse the anticipation of “Grosz’s Postmodern Darwinism” and suggest that firstness is the mutation of natural selection, secondness the necessity of sexual selection that all humans are subjected to, and third, the affective meaning, the remixed images, we all use to return these poignant utilitarian choices back to the comedy of cosmic firstness.